As a keen amateur astronomer I have had the fortune to try out some of the best telescopes on the market. I genuinely do love this hobby and it is something that I feel more people should give a go. While a first time astronomer may want a more modest telescope. For those who already have a love for the stars and planets, you will want something a little more powerful, awesome and generally more spectacular. Well the good news is I was able to try out two of the more high end telescopes recently and I really put them through their paces. So just down below I am putting the Celestron NexStar 8 SE Telescope and the Meade 8-Inch Advanced Coma-Free Telescope head to head! The first telescope I tried was the Celestron NexStar 8 SE Telescope. I have used a couple of Celestron telescopes before and have been impressed. This one here is said to still use somewhat older technology, but it works like a charm and I always say if it is not broken then do not fix it! One thing I really like is the way it has a StarPointer Finders Scope which helps greatly with alignment and finding celestial objects. The huge database makes finding and learning about objects nice and easy which may come in very handy for someone who is new to stargazing. I honestly have a hard time suggesting anything other than this telescope for a first time buyer. It just makes things so much easier and fun that it really is a very easy recommendation. The more expensive Meade 8-Inch Advanced Coma-Free Telescope is brought to us from Meade who are one of the leaders when it comes to telescopes. This is one of the more expensive telescopes I have had the pleasure to try and it did have some pretty cool features that really did impress me. The huge selling point of this telescope is that it has “Advanced Coma Free Optics” which is a fancy way of saying the objects you will be looking at will be sharper and brighter than you can imagine! This really is a high end telescope, but I do feel that it is one that is more for someone who has had a couple of telescopes before. A person who has dabbled in astronomy before will not have any issues with this, but a first time user may be a little put off. Which Telescope Is Best For Viewing Planets? Wow I have really started this off with a tough one! Ok so I am going to sit on the fence a little bit here. The Meade 8-Inch Advanced Coma-Free Telescope really does offer a crystal clear image and the Sony GPS that it has is fantastic. But I did feel that this like I said before is a telescope for people who know what they are doing or at the very least are willing to roll up their sleeves and learn about astronomy. If you know what you are doing then in all honesty you are going to be blown away by how clear this telescope is, I know that I certainly was. On the other hand the Celestron NexStar 8 SE Telescope with its huge database and over 200 user defined objects really does make locating planets and other awesome things in the sky much easier for a first timer. I would also say that the general ease of use the Celestron offers makes this a fantastic telescope for someone who is rather new to the hobby. While many people will say that the Meade offers a much sharper image, I to be honest did not notice it all that much. 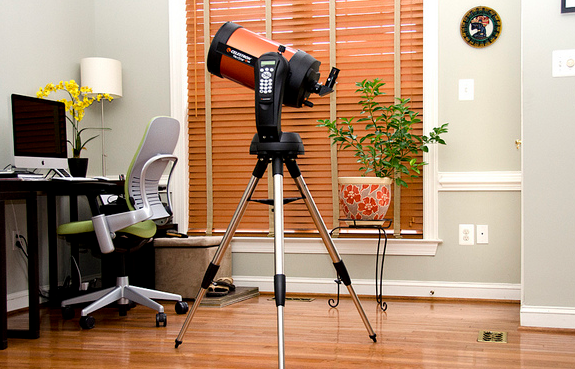 But if I had to jump off the fence and pick a winner I would have to go for the Celestron. It is just that it is easier to find what you are looking for with it. Well really this is quite an easy answer and that is the Celestron NexStar 8 SE Telescope. It really is very easy to use and the keypad that it has is something that even a person who has never used a telescope before will be able to get to grips with. It is like they have gone out of their way to make this telescope as simple to use as possible and I am actually scratching my head right now trying to think of one issue I had when using it. It was very straightforward and the book it comes with I am sure will come in very handy for someone if this is their first telescope. That is not to say the Meade 8-Inch Advanced Coma-Free Telescope is hard to use. It has some amazing features and I have read some people’s reviews where they say that once you get the hang of this there really is no going back. That is great and something I could actually kind of agree with. But the fact of the matter is that there is a bit of a learning curve when it comes to the Meade 8-Inch Advanced Coma-Free Telescope. Not a huge and complicated one like I may have made it sound, but there is still a learning curve. If this does not scare you off then I say that is awesome and you should go for it! 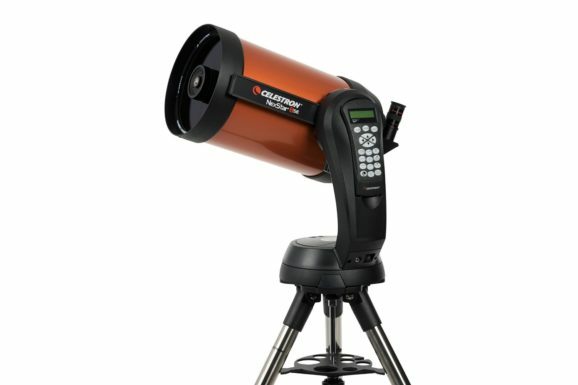 But if I had to recommend one of these to a first time astronomer it would have to be the Celestron. Which Telescope Is Best For The Money? 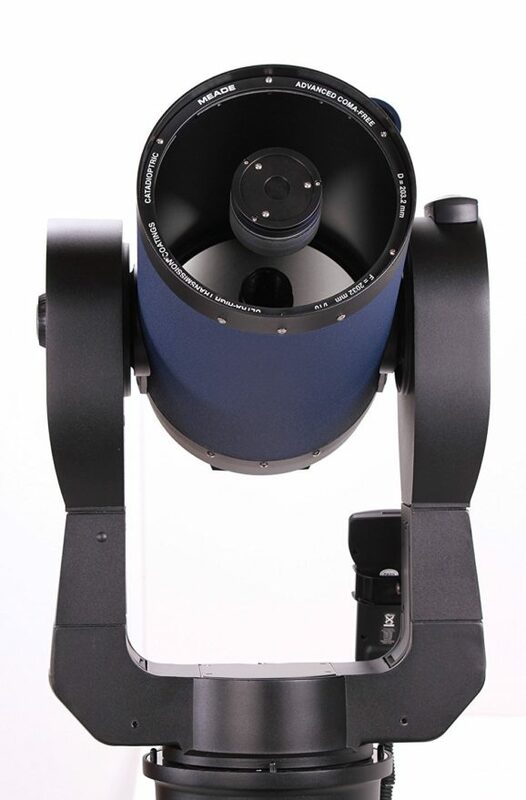 The Meade 8-Inch Advanced Coma-Free Telescope is the better part of $1500 more than the Celestron NexStar 8 SE Telescope and as much fun as I had with the Meade I just in good consciousness cannot say that it was $1500 better than the Celestron. I actually found the ease of use that the Celestron offered to make for a much more fun evening of stargazing if I am being honest. The Meade is great telescope it really is and I did enjoy the time I got to spend with it and I can tell you it really is quite state of the art when it comes to the technology that powers it. But again it did not really make my evening any more enjoyable than the Celestron did. I just think that at pretty much $1500 cheaper the Celestron offers you the better deal. Yes it may not be the latest and greatest when it comes to the technology behind it. But I can still assure you that you are in for a fun night when you have this out in the backyard. Not only that it will take you no time at all to get the hang of it and you will have a lot more money in your pocket as well. Don’t forget to check out our guide on the best portable power for telescope.